With our custom printed POP- Point of Purchase display boxes you can have a way to store and advertise your products or company at the same time. 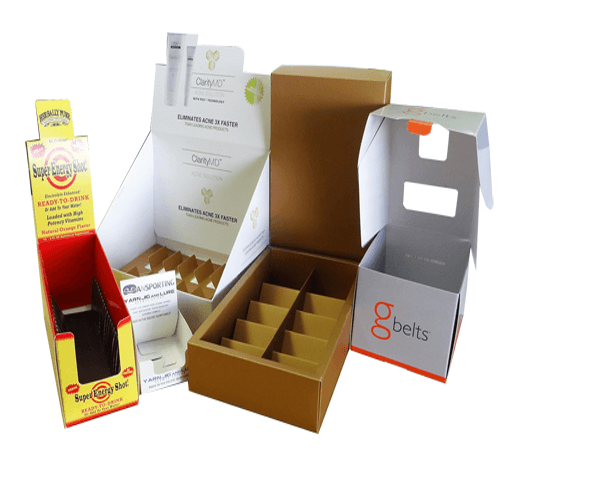 Our POP (point of purchase) custom display boxes are a popular item among customers who sell small cashier-side products as this type of packaging is an extremely effective manner of selling your products to customers on the fly. With Business Image Printing you too can have a custom printed POP custom display box designed and built specially for your products from energy drinks to candy bars. All you have to do is let us know any of your designs and product specifications and we can start working on what is to be your product’s future custom packaging. With virtually limitless customization you can create the perfect packaging solution for you product no matter the size or shape. Additionally, we also offer additional features that you can choose to include with your purchase that can augment the style of your packaging such as custom foiling for some extra flair or embossing to add unique designs and patterns to your custom printed POP custom display box. Nowhere else but Business Image Printing can you get such great custom packaging at such low prices and fast turnaround. For more information regarding any special additional features such as spot UV coating, hot stamp foiling, or embossing, feel free to contact us for more details.